Looks amazing in our bathroom. The color is true..the Size is great. People come to my home and ask where I purchase it from. I will recommend it to anyone. Inspired by Moroccan tiles, this two-piece bath rug set enriches any space with a subtle, yet eccentric style. Sink your feet into the color-rich softness of this beautifully designed bath rug set. The set features hues against natural to create a artistically creative look in any bathroom. Plush fabric cushions the feet for pure comfort, while a water-absorbent construction ensures lasting quality. These bath rugs are available in 4 natural, soothing tones. We created color combinations that create complementary contrasts while maintaining a unique sense of style. 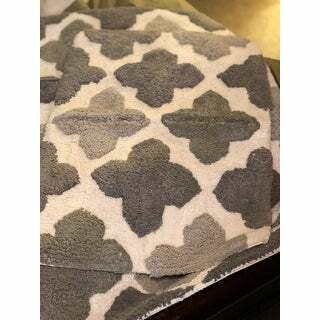 These quality bath rugs are machine tufted from 100% cotton with a lightly sprayed anti-skid back. Use to complement solid, patterned or metallic shower accessories. The set includes one-21"x34"bath rug and one-17"x24" bath rug. Ordering process and delivery was easy and fast. The product matched the imagery online and the size of the rugs were nice for my sized bathroom. The quality and product itself is the reason gave a one but what has made this a bad product is the ODOR. I don’t think I can express the chemically aroma as descriptive enough to relay how bad it was and still is. When I open the box it was strong but I decided to let it air out a couple of days. The odor began to linger in the area it was placed. They were laid on top of our bed for a few seconds before I saw it and took them down and now our comforter has some of the scent. Personally for myself who deals with migraines I found myself not being able to be in the space they are at too late no before my head starts to hurt. I do not trust to throw these into the washer I can not allow them in the home much more so my last attempt is placing outside on the deck to see if good old nature can remedy this if not they must be returned . So unfortunately It makes me wonder why is there a need to ensure such strong chemical on the product ? I 100 percent would NOT Recommend this product . Nice set. I wish they were larger. Had to order two sets to complete the look in my Master Bath. Both rugs was thick and lay flat, color was perfect. 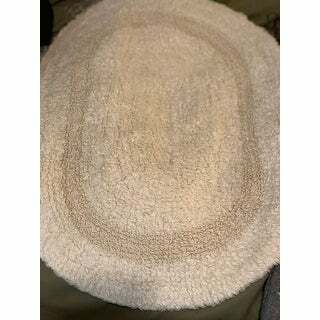 Comfortable to walk on and great quality for bath area rugs. I recommend them for color and quality. We love these bath rugs! I got them for my husbands basement bathroom last Christmas, and they match perfect with the wall colors we picked for his bathroom. They are soft, and don't look bad after few months like most of the bath rugs do. This is a quite thick bath rug. There is variation in height between the colored tiles and the background. It seems like quality. Very happy with the purchase. The bath rugs are well made. Love the quality, construction and colors of these rugs. This bath rug set is just beautiful! The rug don't slip, they have latex weaved in. When my husband saw them he really liked them. I hope they wash good. These rugs added such style to the common bathroom that I decided to go with the colors and find matching accessories. These bath rugs work well. Was pleasantly surprise with the inclusion of the bath rug that was included. The gray and white patterns work well together. Will definitely purchase again. Good. It is a quality product. These rugs look great in my bathroom and are very comfortable. the colors are just what my husband had been looking for and didn't find, I like the brightness that it gives the bathroom so i'm glad I looked in Overstock he was driving me crazy every time he couldn't find it. almost perfect. The sizes are great and very soft on the feet. The colors of grays and white look fantastic with the marble sink tops. I would definitely purchase again. Nice but I wish would it been much bigger version. This rug set, in grey, looks exactly as pictured. The texture is great. The rugs are thick and provide great padding. Nice rugs but not as large as I was expecting. Look nice and stay put. The quality & design far exceeded my expectations. Extremely pleased. It's colorful and looks soft and comfy. The colors will match in bathroom and it is a fun pattern. "Is the spa mat more of a gray or a green color?" The colors are charcoal and light grey with a beige background. "How do you know which color is what?" Please flip through the image carousel to see the images labeled with their color names.